Due to a shoulder injury “Michael” had to leave his work and started an alternative job as a taxi driver. Unfortunately he was held up at gun point in his taxi and is now too traumatized to return to this work. He is reliant solely on a Newstart payment which leaves him a total of $11 a fortnight to live on after paying his mortgage! “Michael” sought our help with an overdue rates bill. We were able to provide some financial help and were able to organize with the council a moratorium on further payments for a period of time to give him a chance to recover. “Jenny” is a mother of two children who was the victim of domestic violence and was homeless. She was desperate for housing and through WAYSS was finally able to get some accommodation in a caravan park. She had to find rent in advance and the Centre donated $400 towards rent in advance. “Amy” came to see us very distressed. After being reduced to homelessness due to a number of tragic circumstances, she was given the only available accommodation in a boarding house in Endeavour Hills. Her room was freezing with the only ventilation coming from a broken skylight above her head. All the walls were marked with graffiti and newspaper covered up holes in the wall. The room was infested with cockroaches and she dared not leave her room because other residents surrounded and intimidated her, demanding cigarettes. Not surprisingly, she was depressed and quite traumatized. Between ourselves and WAYSS she was given 7 nights accommodation in a motel until we were able to accommodate her in one of our emergency units. The Centre is now providing her with a number of different services to help her recover and regain confidence to seek more permanent safe, affordable and appropriate accommodation. 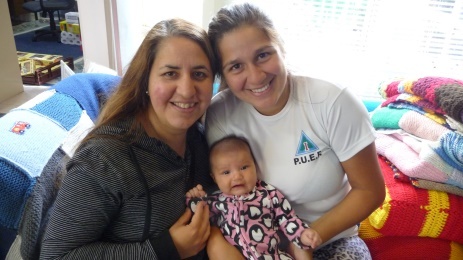 “Maree” is a mother with two young girls who has been in Australia for the past four years after marrying an Australian man overseas who then sponsored them to return to Australia with him. She had been working up to the end of last year when she lost her job. Her husband recently abandoned her and the girls and moved in with his mother. “Maree” was left with no income so that she could not pay the rent nor even feed her family. Dandenong WAYSS in desperation asked us to accommodate the family whilst everything possible is done to try to help the family be able to stay in the country. Both girls are particularly desperate to stay! The Centre is currently supporting them with all housing, food and transport costs. There are so many families in housing stress due to the fact that rental costs have risen markedly at a much faster rate than income! It only the takes the simplest unforeseen circumstance such as an unexpected car repair and families find themselves behind in rent! Over the past three months we have supported 26 different families who were either homeless or in imminent danger of eviction at a total cost of $11,729.50. 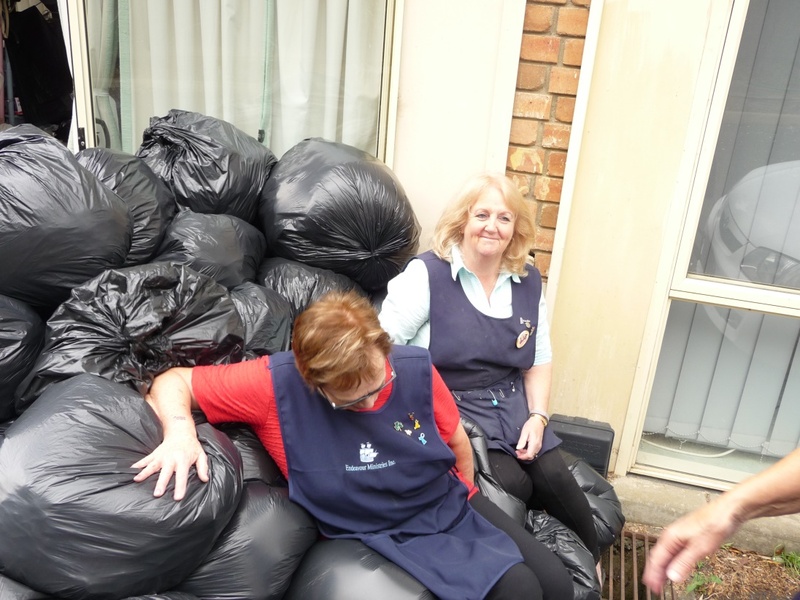 We have also provided bedding, swags and blankets to many who are on the streets. In the past three months we have had six different families in our emergency accommodations. Two families have now left two of our units and have found accommodation nearby. We were very glad to help them financially to cover some of the bond and rent in advance and removalist costs. The units are now occupied by a single girl, a family of three seeking help to stay in Australia, an elderly mother and her son and a single father with two daughters. Many needy families have been provided with assistance with chemist, utility, upfront specialist fees, medical equipment, petrol, car registration and car repairs and educational expenses such as uniform, camps and computers and even loan cars! Thanks to Dr Mark we continue to provide dental help for people who are in immediate need and unable to afford dental treatment. The Centre also seeks to encourage high achievers whose parents are not always able to afford them the opportunity to pursue their area of expertise. “John” came to Australia and immediately secured work. All was well until he started to notice that he was not easily able to read small print. He thought he just needed glasses and made an appointment to see an optometrist. It turned out unfortunately that he had a genetic disease and his sight has quickly deteriorated to the point where he is now legally blind and could no longer work. At the time he came to us for assistance he had lost his home, was relying on a friend for a roof over his head and had very limited finances. We were able to link him with a social worker to help him apply for Centrelink assistance and also provided assistance with filling in the forms, a support letter and emergency food vouchers and food. Thanks to the brilliant design work of Bill Matthews and the great carpentry skills of Ray Taylor we now have new shelving in the Food Relief room!! – For the first time everything fits!!! 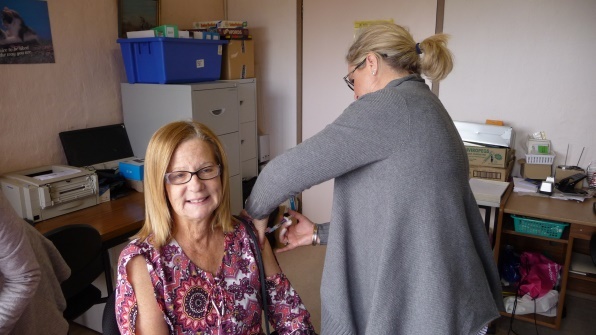 A steady stream of people took advantage of free flu injections at the Centre in May provided by Monash Health. The Monday Meals team is now catering for anything up to 90 people each week and it is often a lot more!! They do a wonderful job catering for so many and even giving “little extras” for the participants eg bananas and muesli bars etc to take home. 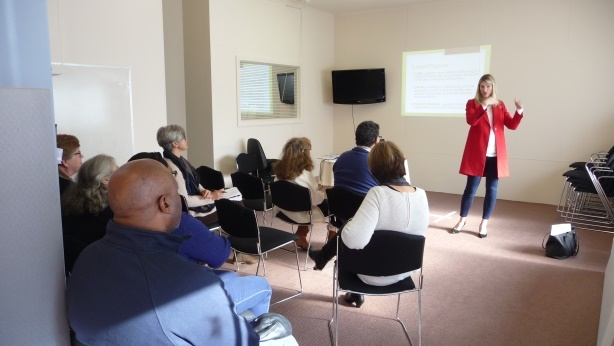 Those attending the Thursday meals over the past three months have been privileged to enjoy a brief talk each week from one of our psychologists, Rosemary Steer, (ably supported by counsellor Shadia Matthews) to help them better understand themselves and others. We are so grateful to our faithful team of cooks, setup/packup teams and cleaners who do such a great job each week to make this ministry possible. We also give a special thank you to Barry who has been setting up and cleaning up after every Thursday meal but has to retire from this job because of ill health. Winter crops are now in and all the garden beds have been claimed by enthusiastic gardeners. The chooks have ensured a steady supply of eggs which have been used in the meals and for distribution to families in need. Some of the vegetables have also supplied the Monday and Friday meals and the scraps from the meals go back into the garden compost or to the chooks!! Thanks to Tarj Jedrys we now have a new glass house We can also boast our own composting toilet on site!!! It is always a challenge to meet the demand for counselling at the Andrews Centre, despite the fact that we have 7 psychologists and 3 counsellors on board!! The waiting lists never seem to shorten!! There are so many families and individuals struggling with everything from depression and anxiety, addiction issues, family breakdown, trauma, anxiety and clinical issues such as eating disorders, schizophrenia, bipolar disorder As well as bulk billing clients to make sure everyone who needs counselling can afford it, the Centre continues to provide financial support to ensure people on low incomes can access counselling services and the assessments they might need. The counselling team continue to meet once a month together and to support and encourage one another and share knowledge and insights in the very important work that they do. A wider network of psychologists from outside also meet once every two months at the Centre. We are also ever grateful that we can also make available free legal counsel for many on low income who can feel utterly at a loss as to what to do in situations where legal action is required. Two seminars were held this quarter to make sure all families are aware of how they might be able to access the help available through the government for any members of their family with a disability qualifying them for funding under the National Disability Insurance Scheme. The program is entitled “Keys to Connect” and it is aimed at equipping children and adolescents with these very important qualities of self awareness, social understanding and interpersonal skills. Thanks to a youth grant from the Commonwealth Bank the Centre will now be able to provide two special group sessions for children and teenagers who struggle with social anxiety and other issues which can make it very difficult for them to cope in school and other social settings. Negative social experiences can have long term consequences on future family, relationships, career, success and general well being and self esteem. Bill Matthews and Cas Ricardo are combining forces to run a “Money Minded” course over two weeks to help people manage as best as possible on limited incomes. The course includes creating realistic budgets, saving without missing out and smarter shopping. Keeping on top of donations! 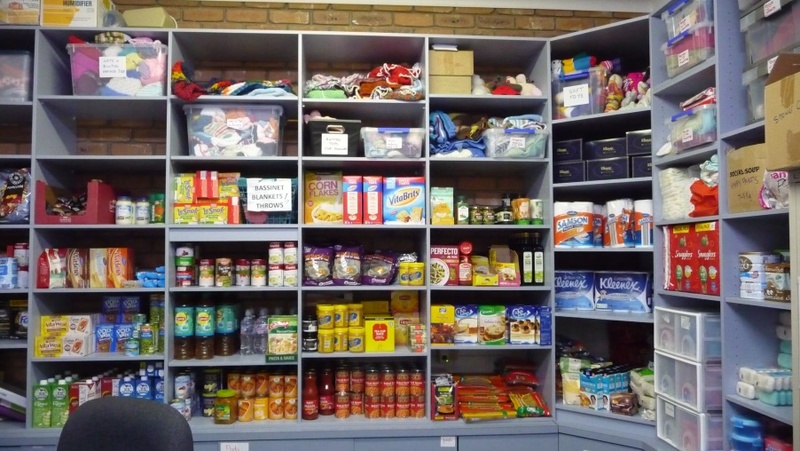 There is a continuous stream of donations faithfully sorted and priced every week at the Shop. The team does an amazing job of sorting, pricing, ordering and selling to keep the shop working so well. We are grateful and humbled by the amazing support we receive from the community at large with the donations we receive. This is now the 25th year this shop has been running and quite a few of the workers and two of the managers have been with us all that time! 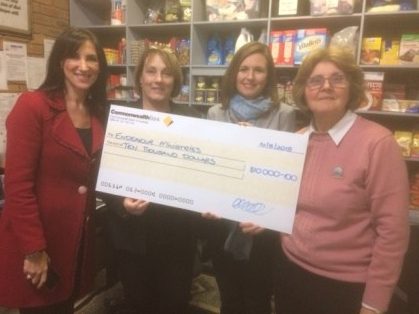 Congratulations to all the shop team for the wonderful work you continue to do to help fund the activities of the Andrews Centre. Thank you to all who support and make possible all that is Endeavour Ministries Inc.
Endeavour Ministries acknowledges with sincere gratitude our financial support and partnership with The Andrews Foundation and the valuable support of DSS, , Endeavour Hills Rotary, EC White Trust, Commonwealth Bank, Specsavers Endeavour Hills, The Lucinda White Trust, Endeavour Hills Lionnesses, City of Casey, , St Matthews and St James Anglican Churches.